On April 25, CLEE hosted Rhode Island’s First Equity Summit. Over 125 students, teachers, and school leaders were in attendance celebrating our communities fierce commitment to educational equity. Attendees explored the journey of a consortium of Providence and Central Falls schools engaged in a sustained effort to increase equity, engaged with the student perspective on topics of equity, and heard from Zaretta Hammond, a thought leader in the work of equity and cultural responsiveness, and author of Culturally Responsive Teaching and the Brain. The event explored our successes, challenges, and set next steps in our personal and collective efforts to increase equity. Three videos were premiered at the event. These videos are important evidence that, together through shared leadership, we are lifting the ceiling on what is possible for each and every one of our RI students. 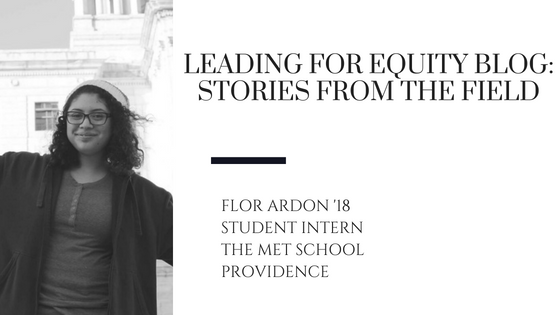 Below is the perspective on the Equity Summit of Flor Ardon, CLEE’s student intern, and a student in RI public schools. Walking into the symmetrical, organized room, the first thing that I noticed was how excited everyone was to be there. You could feel the energy radiating off the room as everyone began to pour in regardless of the rainy atmosphere outside. From that, the most powerful aspect that I saw was that there were people who were willing to make a change in education. Not only that, they were willing to listen to what students have to say. There were student speakers who were there for the same reason that all the adults were there, and for the first time in my academic career, I actually saw adults listen to students. I’ve had experiences before where adults tend to miss the whole point of my argument. Instead of seeing the points in my argument, they focus on the fact that I was being argumentative. This happens with many students but for once, adults listened and I think that was the most powerful action that was taken that day. In addition, there were adults there who were leading the way into a new mindset for educators in order to improve that quality of education. I had the honor of listening to Ms. Zaretta Hammond as she passionately spoke about her approach to culturally responsive teaching. Through her speech, she fascinated everyone as she explained the connections between a student’s brain and their culture. As she used very big science words that I had to google afterward, it was apparent to everyone she made very clear points that were eye-opening for myself and others who listened to her. As the late afternoon progressed, there was also the premiere of 3 different videos that highlighted the accomplishments of CLEE, teachers, and the students. This opened an atmosphere of not only past successes but also new doors to the success that is to come for teachers and students alike. From that, I hope that the atmosphere and quality of conversations that were occurring during the time, from both teachers and students, continue to happen in the classroom. I hope that the adults that were present remember what it felt like to listen to what a student has to say. Not only that, but they may share with their colleagues the reasoning behind it. This may increase productivity in educational reform. It will encourage students to be more engaged in their own education. Personally, I learned that I should be more attentive. Once we start paying attention, we are able to notice things that we didn’t originally see; therefore, we are able to identify something to solve. That’s a rule that applies to everything. If teachers, school leaders, and students are all being attentive to the things that going on around them, they may be able to work together in order to try to solve these situations that arise. CLEE’s mission to provide leaders with professional learning and support to create equitable outcomes for students in our school was present throughout the whole event. Every speaker and every voice heard, from the introduction to the ending, tied everything back to the idea of motivating educators and students alike to continue to make the necessary changes in society in order to be productive in reaching the main goal. It was inspirational to see the growth and to see that it was a step forward in the right direction which made everyone in the room emit a feeling of pride and motivation to continue. If someone is resolved, they are bound to reach their goals. With this in mind, the fact that CLEE was celebrating a success made it apparent that they are moving forward and creating that change that they strive to show. Further, they included different perspectives who provoked challenging questions in the mind of the audiences. Among those brilliant speakers were students, professionals, and CLEE staff who guided the audience’s thinking into a positive outlook of what is to come. Personally, the next steps that need to be taken are to continue. This whole thing is like trying to lose weight. There needs to be a commitment and it needs to continue in order to maintain and get the results wanted. Looking back that this, I now realize that I can do something about all of this that surrounds me. It doesn’t matter that I come from an under-resourced neighborhood, or that I’m pretty average in society’s standings. So when I was asked at the end of the Equity Summit what am I going to do in order to be a leader in leading for equity, I was a bit taken aback. Despite work that has been done and I have even contributed to, there is much more to be done. One thing that I will do is to continue. According to society, I shouldn’t have a say in these things so just the fact of me being here is rebellion enough. So what am I going to do? I will continue to be my annoying self when I want to speak about something. I will continue to speak my mind regardless of how afraid I am. I will continue to share my experiences in hopes that someday things will change. I mean 2 years ago, I saw this movie about North and South Korea and my wish for about a year and a half was to see the two unite before I died. Lucky I saw that and I’m only 18 now. So now, I hope for a functioning education system where every student and teacher alike is able to receive the support that they need in order to reach not only their goals and full potential. And sure that may seem too high a hope, but so did South and North Korea unification. So who’s the delusional one now?